Savings are available to all ages - and your Free Membership will cover your entire family. Click Here to view Rx prices, look up pharmacy locations and learn how to maximize your Rx savings. You can print additional cards for your household members. This, however, is not necessary. The same card will work for you or any member of your household. You may also give cards to your friends and relatives, or direct them to this website to print their own. 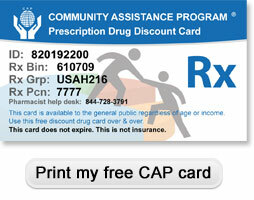 The CAP card is accepted at approximately 80% of pharmacies nationwide. Listed below are some of the chain stores that accept our CAP Rx discount card. The Community Assistance Program is designed for individuals who do not currently have prescription drug coverage and would like to lower their prescription costs. Savings are available to all ages - and membership is absolutely FREE! We use the strength of our partnerships to offer you a program that gives you the best price on your prescriptions. You can use the Rx plan today. Save an average of 15% on brand name drugs and 55% on generics. You will be able to look up prescription prices and pharmacy locations. You can print additional cards for your household members. This, however, is not necessary. The same card will work for you or any member of your household. You may also give cards to your friends and relatives, or direct them to this website to print their own. Our USA Drug Plan card is accepted at approximately 80% of pharmacies nationwide. Savings are available to all ages and Membership is absolutely FREE!